Abstract: This article recalls the life and work of the late Professor of Social Work, Edwell Kaseke, who passed away on 24 August 2017. It also sheds light on the work that this author had collaborated with him. The paper is both a tribute and an acknowledgment of the immense contribution that Professor Kaseke had made towards the advancement of social work not only in his country of origin, Zimbabwe, but in Africa and globally. He had also raised African scholarship through his various academic papers, book chapters, books and research projects. This writer had known the late Professor as a colleague for close to 17 years, in the academic circles of social work and social development. For most of this time, this author was a younger scholar whilst Professor Kaseke was an older colleague who would advise and guide him in matters of scholarship and other issues. Later, as the author grew academically, he collaborated with the late Professor on some academic projects. Professor Kaseke was very passionate about building theories and bodies of knowledge in social work, social policy, social security and social development that were Afrocentric and relevant to Africa's development. 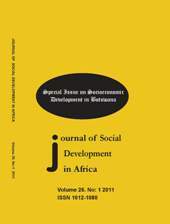 Abstract: The article examined relational mechanisms and underlying processes of informal social protection in a migration context. It examined the role of migrants' agency in constructing, mobilizing and activating different kinds of social support from egocentric networks, as part of their ongoing response to a hostile post-migration context in South Africa. It draws on the narratives of three migrants who participated in a study on Zimbabwean economic migrants in Johannesburg. Fieldwork for the study entailed observations at two congregations of the Zimbabwe Assemblies of God Africa, known as Forward in Faith Mission outside Zimbabwe. Additionally interviews were conducted with purposively selected migrants in 2009-2010 and 2016. The findings highlight that informal social protection evolves out of the interplay of moralities of care, protection and reciprocity with the individual and collective agency of migrants. Therefore, while its adequacy remains in question, informal social protection is complex, yet sufficiently flexible to respond to personalised needs of individual migrants. Abstract: This contribution, while concentrating on one of Professor Edwin Kaseke's favourite research topics (i.e., social protection) and reflecting on some of his work (in some instances with colleagues, argues that Professor Kaseke essentially called for the need for and emphasised the importance of the Africanisation of social protection in Southern Africa. Within the framework of this paper, Africanisation entails a scenario whereby social protection is responsive to and accommodative of the needs and challenges imposed by the local (African) context. Thus, social protection systems must be relevant to the social needs and challenges of the communities they are intended to serve. This should be evident from among others, the history of social protection in Southern Africa; conceptual framework, legislative and policy structure; social risks; personal and territorial scope of coverage; administrative and institutional design; quality and quantity of benefits disbursed; as well as monitoring, adjudication and enforcement mechanisms. The article pursues its objective by focusing on the aforementioned key social protection areas which formed part of Professor Kaseke's interest in a majority of his research output on social protection. This discussion is followed by some concluding remarks from a forward-looking perspective. Abstract: Social security remains critical to the welfare needs of many in society. However, for developing countries like Zimbabwe, social assistance and social allowances have receded due to the prevailing economic challenges. The hard hit are those living in rural areas mostly not covered by the remaining social insurance schemes provided by both government and private players. Severe droughts and occasional floods resulting mainly from climate change have further exposed the rural population whose livelihoods sources remain mostly agro-based to perennial social insecurity. For them, the remaining sources of livelihood now reside in non-formal social security arrangements anchored upon a staggering cultural base being eroded by the fast encroaching tide of neoliberal individualistic ways of life. Regrettably, government has got no institutional framework to promote non-formal security arrangements upon which the rural folk have depended since time immemorial. This paper therefore seeks to examine the institutional mechanisms required to bolster and promote existing social security programmes in the rural areas of Zimbabwe. Abstract: Informal social security, particularly Rotating Savings and Credit Associations (ROSCAs), popularly known as stokvels in South Africa, are widely used within the developing world, especially in sub-Saharan Africa due to the weak and/or non-existence of formal social security. These stokvels remain a major form of social protection for the poor, and their continued existence is a reflection of the absence of a comprehensive formal social security. The study explored the views of stokvel members on how stokvels, as a form of informal social security, can be strengthened to provide meaningful social protection. The study adopted a case study research design, located within a qualitative paradigm. The study population consisted of women members of stokvels with a minimum of five years in the stokvel. All participants were South African citizens residing in Johannesburg's Soweto Township, and were drawn from two different categories of stokvels, namely burial and accumulating savings and grocery stokvels. A key informant holding a strategic position in the National Stokvels Association of South Africa (NASASA) was recruited to be part of the study. Regulation and integration of stokvels with formal institutions, provision of financial support to stokvels through subsidies, and training of stokvel members on financial management skills emerged as part of strategies to be considered in order to strengthen the social protection provisioning of stokvels. It was clear that formalizing stokvels might be one of the possible avenues that could be explored in order to strengthen their social protection provision.